I wonder if she's still there. I went out for the first time in Tokyo one cold November night. The air was filled with the spirit of festivity and the smell of saké, and the Yamanote train was especially crowded with businessmen well ahead of my friends and I in alcohol intake. One of them approached us and asked the usual question “Where are you from?” and struck up a conversation about Japan, year end festivities and whether or not we liked raw fish. It was a good thing he spoke English, otherwise it would have been a very short conversation. Anyway, by the time we arrived at Shibuya Station, he had already invited us for a drink and we had accepted. We got out of the station and he led us first across the main street, then under a bridge, then into a smaller street and then another. I’m sure if someone today asked me for directions to the bar where we ended up, I’d have a very hard time giving them. Anyway, I stood outside the bar not sure what was expected of me. The exterior was made of three wooden boards that were fastened together by what looked like door hinges. The boards ran all the way to the underside of the bridge overhead, so there was no need for a roof. I untied my shoes, left them at the door and went in. The interior of the bar was even more surprising. I know no better way to describe it than to say: It was really, really small. 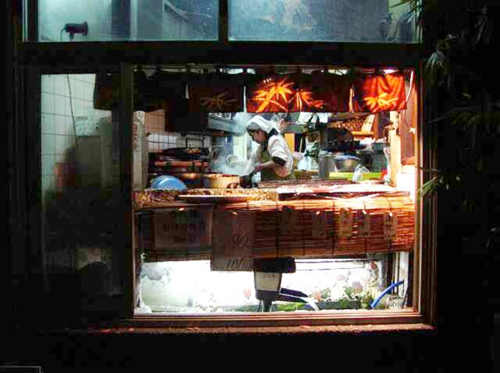 There was an L-shaped counter about one and a half meters long, behind which stood a middle-aged woman cooking oden. On the other side of the counter sat two customers on high stools with their shoulders practically rubbing against each other. We squeezed into the bar and two of us sat at the short end of the counter while the other two stood. The woman behind the counter looked like she didn’t even notice us, but she greeted the businessman with a cheerful “okaerinasai” (welcome back) and poured him a glass of beer. He ordered beer for me and my friends and we were all set. This is one of hundreds of tiny unlicensed bars in Tokyo. When we had arrived, everyone in that bar had seemed more or less sober, but after an hour all of them including the woman herself were becoming much more talkative and loud. 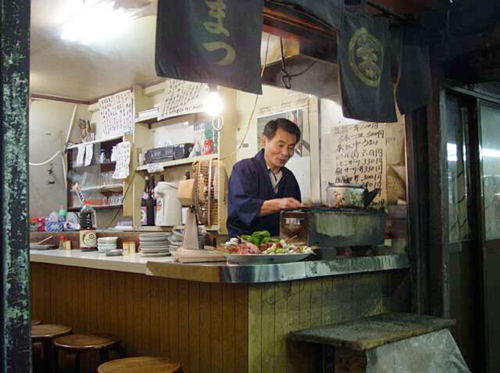 They told us stories about that bar, about how it was built and that it had the best oden in Tokyo, a little of which the woman, losing some of that initial reserve, finally offered us on the house. At the end of the evening we thanked our businessman friend, the two customers and the shopkeeper. Everyone helped with cleaning up and we all closed up the bar and left. In a couple of hours, this place will be packed. Now, almost eleven years later, I still remember that night as if it were yesterday. Since then I’ve learned a lot about Japanese culture. I realize that such small shops can be found all over Tokyo, thriving in the most out of the way places, each with its special food and select clientele. However, the more one knows the less one is aware, and though I am now more knowledgeable about Tokyo, I am less aware of these little details that make up the city. Through the course of my living there, it seems I grew used to what had initially struck me as very foreign. I think that’s the worst thing that could have happened because getting used to the city dulled my senses. When I first arrived I was like a child in Disneyland, wide-eyed with wonder. By the time I left seven years later, I had become blasé. That tiny bar in Shibuya is one of the reasons I miss Tokyo. This story is from Meedo’s upcoming book Small Space in Tokyo and its Architecture. Please feel free to contact us for more details and read related stories here. You make me dream of going there much more now. I can't wait for that book!! What you said last can be so true. This post makes me reflect back at all the small details that make me miss Japan so much! Looking forward to seeing your book! Hey! Thanks. :) Is this Irene from Isozaki (the architecture office I worked at in Tokyo)? I just now discovered your blog post and now Im remember to start with followers. Hello Beer Folk. We are missing you. As semumr winds down we are preparing for our last RV trip of the semumr to pan for gold in Northern California.Our trip to Wallowa lake was great fun. Janice and Karl had their two grand daughters there. We got a bit of a baby fix there.We will be back around September 21. Hello my loved one! I wish to say that this article is awesome, great written and include almost all vital infos. I’d like to see more posts like this.